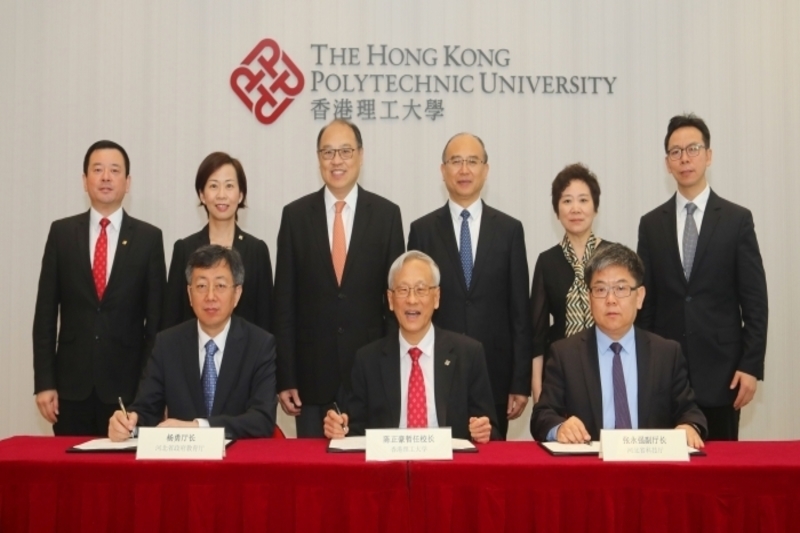 According to a recent press release, the Hong Kong Polytechnic University (PolyU) and Hebei Province entered into an agreement today to establish a long-term province-institution collaboration mechanism. Under the agreement, both parties will proactively enhance their cooperation in talent nurturing, knowledge exchanges, sharing best practices in teaching, student internship, as well as advancing science and technology research and the development of related industries. The Mayor of Hebei Province led a 15-member delegation of the Hebei Provincial Government to attend the agreement signing ceremony on PolyU campus. Together with senior management members of PolyU, they witnessed the agreement signing by the Interim President of PolyU, the Director of Education Department of Hebei Province, and Deputy Director of Science and Technology Department of Hebei Province. Addressing the signing ceremony, the Council Chairman of PolyU stated that Hong Kong has been integrating into the rapid development of the Nation. Under the mega national development plan, the collaborations between Hong Kong and other provinces, cities, as well as universities in the Mainland will achieve win-win situations in strengthening innovative research and talent cultivation by leveraging each other’s strengths. The Chairman pointed out that PolyU is a global pioneer in a number of advanced technology research areas. PolyU has cooperated with Hebei institutions in promoting academic exchanges since 2012. PolyU can further contribute its expertise to support the Hebei Province’s efforts in developing the Xiong’an New District into an international city of high-tech industries. The further collaboration can help PolyU turn its research results into applications, while supporting the transforming and upgrading of enterprises in Hebei. The Mayor stated that Hebei Province is in the historical period of opportunities. While making the steel industry, logistics and cultural tourism central to the provincial development, Hebei has a large-scale advancement in science and technology industries in recent years. The Province’s government highly values the cooperation with PolyU and look forward to promoting the development of education, and technology research with the University. A PolyU alumnus, graduated from the University’s Business Administration Doctoral Programme in 2004, Mayor Xu has extensive experience in promoting advanced technologies. Under the agreement, Hebei Province will support PolyU to translate its scientific research achievements into applications in Hebei through offering funding, strengthening connections and encouraging enterprises to participate in projects, etc, while PolyU will offer high-end technologies and talent supply to support Hebei in developing its innovation capabilities. Both parties will cooperate in the development of science, technology and related industries, in particular for advanced engineering materials, food safety, bioengineering technologies, etc. PolyU will work on collaborating with the enterprises, universities and research institutes in Hebei to establish innovation platforms for sharing large-scale research equipment and jointly undertaking the Nation’s major science and technology projects. Both parties will also collaborate in nurturing talents and facilitating exchanges. Hebei Province will designate outstanding personnel from institutions, enterprises and science and technology units to study at PolyU, so as to nurture high quality management talents and technology teams in innovation for the province. The provincial government will also help PolyU to establish bases in Hebei for teaching and student internships. PolyU students can participate in the winter camp in Hebei and serve their internships in the Xiong’an New District. Reciprocally, PolyU will send delegations of experts and scholars for study tours to offer consulting services and training in Hebei.